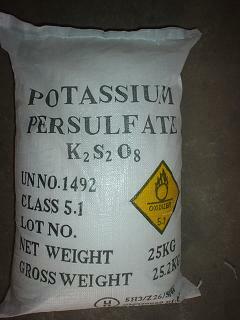 Potassium persulfate is not combustible, but assists combustion of combustible materials due to release of oxygen. It must be stored in a dry location away from heat and a cool, well ventilated area away from all sources of ignition and out of direct sunlight, protected from moisture. Keep containers tightly closed, labeled and well sealed. Ensure pressure relief and adequate ventilation. It must be stored separately from organics, rust or traces of metal, reductions and others incompatible materials to avoid catalytic decomposition. 1 Avoid contact with eyes, skin and clothing. Use with adequate ventilation. 2 Do not swallow. Avoid breathing vapors, mists or dust. 3 Do not eat, drink or smoke in work area. 4 Prevent contact with combustible or organic materials. 5 Label containers and keep them tightly closed when not in use. 6 Wash thoroughly after handling. Inhalation: Remove affected person to fresh air. Do not use mouth-to-mouth resuscitation. Seek medical attention if effects persist. Eye Contact: Flush eyes with running water for at least 15 minutes with eyelids held open. Seek specialist advice. Skin Contact: Wash affected skin with soap and mild detergent and large amounts of water. Ingestion: Remove from exposure to fresh air immediately. If breathing is difficult, give oxygen. Do not use mouth-to mouth resuscitation. Seek medical service immediately.